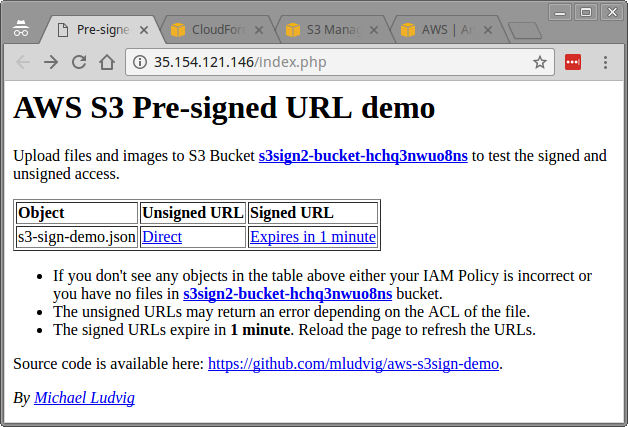 S3 Pre-signed URLs can be used to provide a temporary 3rd party access to private objects in S3 buckets. For example non-public files on a file sharing site can only be made available to the approved users with one-off URLs that expire after 10 minutes. Here we offer a simple demo for testing the concept. In reality you will probably want to grant some more privileges: s3:List*, s3:Get*, s3:PutObject* and s3:DeleteObject* probably. Also don’t forget to update the bucket name in Resource block if it’s different from s3sign-bucket! Refer to the README in the GitHub repository for details. Alternatively instead of following the manual steps above you can use the provided CloudFormation template s3-sign-demo.json that sets us the environment the same way. In the Outputs tab in CloudFormation console you’ll find the IP address of the instance. Most likely you’ll get an Access Denied error when clicking that URL – the file is intentionally not publicly accessible. Some parameters in that long string denote the signature validity (X-Amz-Date, X-Amz-Expires) while the rest provide the cryptographic signature (X-Amz-Security-Token, X-Amz-Credential, X-Amz-Signature, etc). Don’t worry about the details – there are ready made library functions that help you create the URL. For completeness here is the code that generates the Signed URL. Check out the full PHP script in the GitHub project. Is it possible to give ipaddress while crating signed url, so that I can access the url from particular ip only… is it possible? If so can you please provide the sample php script for the same. Hi, not sure if it’s possible per-URL. However you can use a Bucket Policy that restricts access to the bucket for the approved IPs.